In 2015 Heather McKnight took a break from academia and returned to the world of nursing practice. Just 3 years later, however, she realized how much she missed nursing education and nursing students. 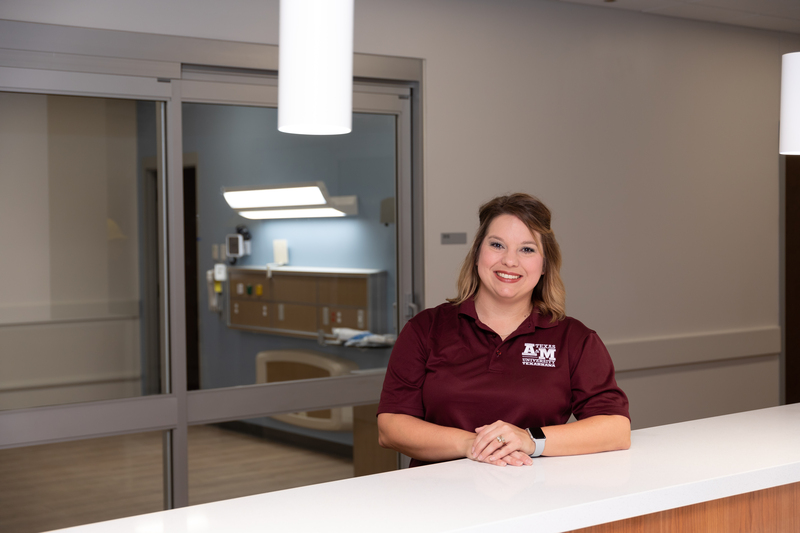 On October 1, 2018 McKnight returned to Texas A&M University-Texarkana as the university's Director of Nursing. With TAMUT about to open a state-of-the art nursing facility and the program poised for rapid growth, it was the perfect time to return to her true calling...the classroom. From 2015 to 2017 McKnight was the Director of Acute Care Services and Magnet Program Director for Christus St. Michael in Texarkana. And while she enjoyed her work, seeing her former students in the field, and realizing their growth and impact on patients, she missed her work in education. "I just love nursing education," said McKnight. "Working with students in the classroom and lab settings you get to be there when everything clicks. You see them have that 'light bulb moment' where it all starts to come together and make sense for them. You don't get to see that in a clinical environment." McKnight is also very excited about the direction the nursing program is headed. The 5 faculty members who teach in the nursing department have a collective 100 years of nursing experience, which when coupled with the TAMUT curriculum is of tremendous benefit to the university's nursing students. While most nursing programs are research focused, says McKnight, TAMUT has chosen an evidence-based, practice-focused curriculum. In early 2019 the department will begin the process of moving into their new state-of-the-art facility in the new Building for Academic and Student Services. The nursing department will occupy the entire 3rd floor of the building with a full hospital simulation lab, health assessment lab, skills lab, classrooms and faculty offices. The simulated hospital has patient rooms, a nurses station, a simulated ICU room and a birthing simulation room. The facility will also come with 20 high-tech manequins ranging from adult sized down to a premature newborn. "We will actually be able to simulate a patient who is coding," added McKnight. "These manequins can be shocked." A&M-Texarkana offers nursing degrees at both the bachelor's and master's levels. Students may take the transitional BSN path or may take the RN to BSN bridge path if they are already a registered nurse. The university also offers a Master of Nursing- Administration degree. McKnight is a native of Texarkana and a graduate of Arkansas High School. She holds a Bachelor of Science and an Associate's degree in Nursing from Southern Arkansas University, as well as Master of Nursing Administration and Doctor of Nursing Practice degrees from Walden University. She has been married to her husband Tony for 19 years and they have two daughters, Berkley (17) and Laiken (13).